Vegetarian recipes are not only the healthy option, they are in general quick and easy to prepare. Scan down our list below and we are sure you will find recipes just for you. 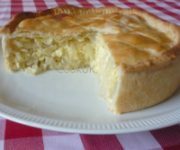 A delicious British style pie made from crumbly cheese and onions. Encased in shortcrust pastry this is food at its best. The very tastiest way to use up yesterday's cooked mash and cabbage. 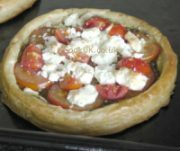 Sweet tomatoes and salty, tangy feta cheese on a puff pastry base. 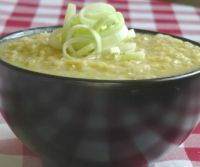 A tasty and nutritious soup which is easy to cook and most importantly tastes superb. Potatoes, herbs, garlic, eggs and flour are the ingredients for this simple but very tasty recipe. A delicious vegetarian main meal pie. The chunky chestnut mushrooms combine very well with stilton and green peppercorns. Even if you are on a tight budget, this vegetarian recipe proves that good, tasty food is yours for the cooking. 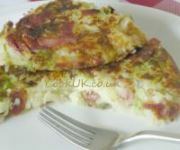 The best known Spanish tapa recipe. Fry the cubed potatoes, then smother them in a spicy Spanish tomato sauce. tasty indeed. A true flavour packed vegetarian recipe. Hasselback Potatoes are a great alternative to baked potatoes. In our vegetarian recipe, we have two toppings for them but use your imagination for different toppings. A traditional vegetarian alternative to a meat pasty. This cheese and onion recipe is both delicious and easy to cook. With only ten minutes preparation time, this is a great meal if you are busy. Serve one half as a starter or both halves as a main meal. This is one of our favourites vegetarian recipes and gets cooked frequently. 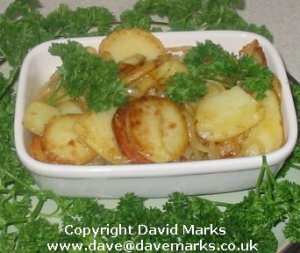 This is a classic French way to serve potatoes which adds a touch of class to any meal. It's sliced potatoes poached in cream and garlic. Great with stews and casseroles, it's a pity that they aren't cooked more often. 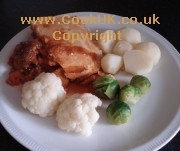 Dumplings are simply flour and suet cooked by placing them on the top of the casserole or stew. Use no animal fat suet. 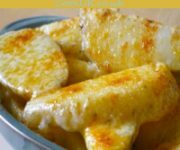 Another classic French potato dish. These are so delicious you could eat them as a meal on their own! Slice and fry the potatoes, add onions and seasoning then eat. A risotto always tastes delicious but this one is spectacular. By roasting the mushrooms before adding them to the risotto their flavour is enhanced. Simple is always best and this vegetarian recipe proves it. Take one sweetcorn with its leaves still on, soak it in water and then grill it on the barbecue. The result is the tastiest sweetcorn ever. This is one of our more complex recipes but the result is a delicious, exotic vegetarian dish. We recommend you give this recipe a try. 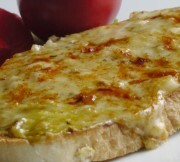 This is not just cheese on toast, this is traditional Welsh Rarebit. Prepare and cook it in under 20 minutes for a tasty light meal suitable for vegetarians. A traditional Greek dip for a variety of dishes. Made from Greek yogurt, cucumber and herbs. More substantial than normal chips, these are a great evening snack. 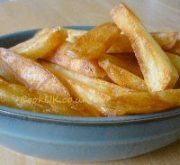 Shop bought oven chips are very bland compared to freshly made oven chips. 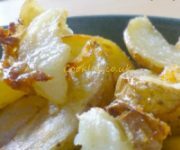 The only ingredients required are some potatoes, oil and a sprinkling of salt. A delicious vegetable broth recipe which is simple to cook. At the same time it's a nutritious and money-saving vegetarian meal.